There are several types of backup power sources that are used with SELENA LED clocks depending upon their function and operation in the system. All SELENA clocks have an internal self-recharging backup installed. It is designed to sustain the internal time-keeping functions and will provide enough energy to make the clock count real time for at least 2 weeks while the supply power is disconnected. This backup will automatically fully recharge itself within appx. 30 minutes when the supply power is restored. This type of backup DOES NOT provide power for the display. NOTE 1 : The internal self-recharging backup will not be installed if the Internal Lithium Baterry is installed instead ( option # 719 ). NOTE 2 : When option # 708 is also installed, the timer count may be continued or recalled even after the power is dsconnected for up to several hours. This is an option that can be ordered to be installed instead of the self-recharging backup. This backup will provide enough energy to make the clock count real time for up to 10 years while the supply power is disconnected. NOtE 1: In most applications the Lithium Battery backup may not be needed, since the standard, self-recharging backup is enough to suppoprt the time-keeping in the events of temporary supply power loss for up to several weeks per charge. It is very rare that the supply power is lost for longer than several hours at a time. Some SELENA clock models may be ordered with this internal, rechargeable battery that can provide power to all internal electronics and to the display for a limited period of time, while the regular, external supply power is interrupted. The advantage of this type of backup is that the clock will operate normally during the absence of the supply power, including the normal operation of the display. The period of time that this backup will last for depends upon the particular type of the battery installed and the clock model, as well as the brightness that the display it is set to. The lower the brightness, the longer the battery charge will last. Because of the limited space inside the clock enclosure, the batteries will usually last from a few up to several hours of opeation without external sypply. An automatic battery charger may be installed internally inside the clock as well, so that the battery remains fully charged as long as the external supply power is present. All batteries have limited life and their charge capabilities deteriorate with time, so the internal battery may have to be replaced form time to time, usually every several years, depending upon the frequency of the charge-discharge cycles. NOTE 1 : The standard time-keeping self-recharging backup in SELENA clocks is usually also installed, so that the clock will not lose the time count when the Internal Battery Supply is being replaced or disconnected for limited periods of time. NOTE 2 : Some SELENA clock models may be ordered with the Internal Battery Supply only, without the external supply power connection. 1. option # 12BAT , when with external charger connection. 2. option # 12BATCH , when with internally installed charger. When the SELENA clock is ordered for 12VDC supply, it will require an external, rechargeable 12V battery.that can provide power to all internal electronics and to the display for a limited period of time. The advantage of this type of backup is that the clock or timer will operate normally at locations where the power line is not available. The disadvantage is that the battery has to be recharged. Note, that compared to the Internal Battery Supply, the External Battery pack is usually larger and can hold much more charge, so that the power will last much longer. The period of time that each charge will last for depends upon the particular type of battery used and the clock model, as well as the brightness that the display it is set to. The lower the brightness, the longer the battery charge will last. The batteries will usually operate from a few up to several hours per charge. An automatic, external battery charger is usually also provided with the battery pack. Model BK12V7H02A - external battery backup pack for clocks running on 12VDC supply. 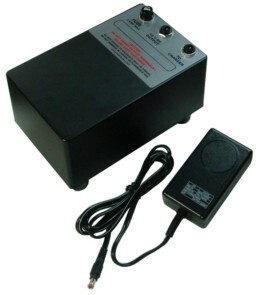 Model BCH1205 - battery charger that can be used with 100 to 240Vac , 50/60Hz power lines. All batteries have limited life and their charge capabilities deteriorate with time, so the battery may have to be replaced form time to time, usually every several years, depending upon the frequency of the charge-discharge cycles. NOTE, that the standard time-keeping self-recharging backup in SELENA clocks is usually also installed, so that the clock will not lose the time count when the Battery is being replaced or disconnected for limited periods of time.